Bombay Harp can be a unique and elegant addition to your event with the melodious sounds of Bollywood being played through the enchantingly good harp strings. For the classy Indian or South Asian wedding where you do not want the typical music blasting and people trying to speak above the noise malarkey, then the Bollywood harpist available through Kudos Music is the right person for the job helping to set a relaxed, comfortable and elegant ambience around your wedding venue. Bombay Harp is an affiliate of Kudos Music, a company through which we can provide to you the perfect Bollywood harpist for your big day. Bombay Harp has experience of performing at well over 200 South Asian weddings playing classic and modern day Bollywood hits to maintain an atmosphere of calm elegance around your setting. The harp itself is an instrument which has been around for centuries, earning the label of being one of the oldest instruments in the world. No fuss, no drama, the sounds created by the harp are beautiful, melancholy and ever so relaxing, ensuring a wonderful vibe among your guests and making sure that everyone leaves with a smile on their face. Most commonly booked for civil weddings, champagne receptions and for background music during an event, the sounds of the Bollywood harp will drift around the room in a soothing manner adding a unique touch of flair to your proceedings. Played by professional, fully qualified and very well experienced harpists who have even played with the likes of the BBC Symphony Orchestra, the London Sinfonia, the Cleveland Orchestra and the City of Moscow Ballet, Bombay Harp will guarantee that in regards to the music on your day, everything will run smoothly the way it should meaning you have one less thing to worry about. With many Bollywood songs in their repertoire as well as some Western classics and religious pieces, Bombay Harp surely have something for everyone with high-end, elegant musical tastes. Whether you want something religious played during your ceremony, and then something more Bollywood during the reception, we will ensure that the right package is put together for you so you are able to sit down and enjoy the playing of the harp on your wedding day. Contact us today if you want elegance and class to be a main feature at your wedding. With Bombay Harp you just cannot go wrong. 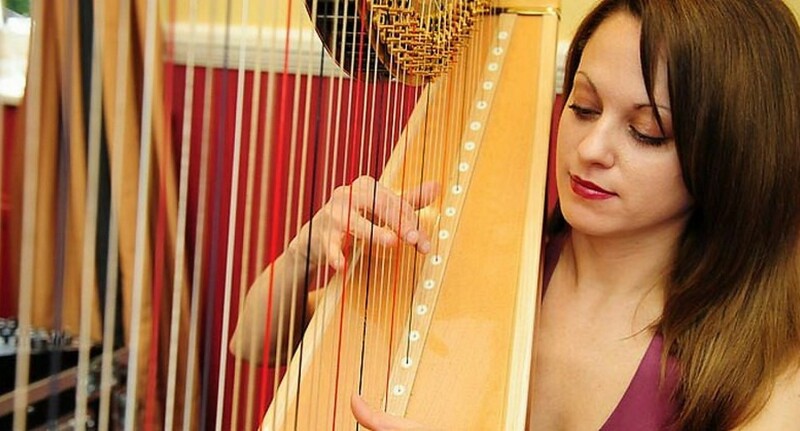 Why not book a Kudos Bollywood Harpist for your wedding or event today! Contact the sales team to see how we can find the perfect entertainment for you.